It’s spring, three weeks left with my seniors, and time to review what worked well this year–and what didn’t. And one thing that I’m never fully happy with is my peer review process. I’ve used myriad ways: Google forms, Google docs, plain old hard copy. This year I used peergrade.io, which is a handy tool and helped the organization of it all. But still, I’ve never been content. Some students take it seriously. Some don’t. Although I know these are teenagers, and I may not get 100% engagement every minute of every day, some peer review half-heartedly. I don’t blame them. I blame myself–at least partly. As a teacher, I don’t feel like I’ve yet truly prepared them all for peer review. In fact, there have been years I bypassed using peer review completely–after all, I decided, I’m the teacher. Shouldn’t they get their feedback from me? Then I think back to my masters degree workshops. I learned just as much about writing reading and thinking through giving feedback on o thers’ papers as I did getting feedback for my own. Perhaps even more. 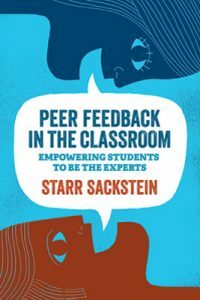 This past week, I read Starr Sackstein’s new book Peer Feedback in the Classroom, which gave me a great idea: Jigsaw peer review. Rather than having students assess all aspects of writing, Sackstein describes how “expert groups” focus on one area of writing, such as introduction, analysis, and organization. I love the advantage of having students focus on one area. It’s less overwhelming to them, especially for those who aren’t completely confident in their feedback. This is certainly something I’ll try next year–and if you get a chance, take a read of Peer Feedback in the Classroom. It applies to ANY type of peer feedback, whether it be writing, art, science projects, or any type of student creation.